A cultural history of the horse and humankind’s relation to it. ...strange and fascinating … What the horse requires, Raulff suggests, is an “histoire totale.” What he offers instead is a sweeping cultural history, more kaleidoscopic than totale, as bibliographical as it is historical … Farewell to the Horse is a whirlwind that seems capable of drawing into its vortex almost anyone who ever thought of a horse. Jacques Lacan and Alan Turing and Lucian Freud, Goethe and his writing stool, Myron Cohen and his one-way street joke, Nietzsche and his mad embrace of a beaten cart-horse—these and a vast crowd of occasional and oblique equestrians make it clear that what Raulff is tracing are the endless impressions the horse has left on the minds of humans. 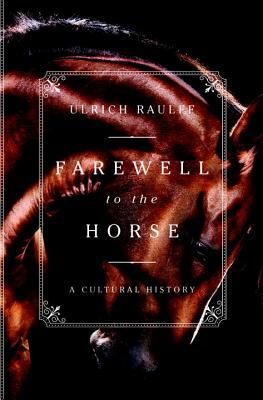 In Farewell to the Horse, Ulrich Raulff has composed nothing less than a requiem Mass for this long-suffering, noble creature — a complex and lyrical argument that places the horse in a central role in the creation of the modern world … Raulff takes us through the stupendous cultural shift from agraian life to urbanized industrialization to the actual and symbolic roles of the horse in war and science and art. He shows that beyond pulling carriages, carts and artillery caissons, horses propelled science into a new age as a crucial subject in the study of anatomy, geneology and locomotion...In his searching examination of the horse’s symbolic significance, Raulff illustrates how the animal represented notions of victory, sovereignty, wealth, death and nobility … Raulff has given us an eloquent epitaph for the horse’s long relevance to our world. [Raulff’s] zeal for horses and his admiration for their gifts propel him and the reader through a long, complicated, somewhat disjointed . . . what? History? Treatise? Memorial? Tribute? Eulogy? Farewell to the Horse is all of those things and something of a love letter besides … Mr. Raulff admits that this last section is not a classical ending with a summary or a synthesis. He has ‘no conclusion, but rather a collection: a loose anthology of possibilities and ways of narrating the history of horses and people.’ After reading more than 300 dense but more often dazzling pages, marveling all the while at the scope and audacity of the author’s undertaking, I found this refusal to draw conclusions disappointing. What did you think of Farewell to the Horse: A Cultural History?